I’m going to give you a secret to looking and feeling great. Most people are shocked when they find out how old I am. They always think I’m at least twenty five years younger…and they were thinking I looked great for that age. The reason I look so good is that I focus my exercise program on the right body parts. Whether you’re a man or a woman, it’s critical to have arms and shoulders that are toned and fit. If you’re a guy, you want to have well defined arms. You don’t need to have arms the size of tree trunks. Look at the actors who are rated the sexiest guys alive. They’re not the knuckle dragging monsters that look like they use steroids! It’s the lean, fit guys that are making the ladies salivate. You see, you may have a wonderful six pack abs or well defined chest muscles, but when you are in your street clothes, no one can see them. But if you have that massive V shape with bulging shoulder muscles, your body frame will tell the world that under those clothes is a well defined body. And ladies, what’s one of the worst things that can happen to your body as you age? Drooping arms! Arms with flapping flesh are the dread of all women who want to maintain an attractive appearance. Many people make the big mistake of emphasizing exercises like bench pressing that puff up your pectoral muscles. But they neglect the shoulders. What happens is you become off balance. Shoulder injuries like rotator cuff tears kill off so many people’s work out life, it’s really scary. 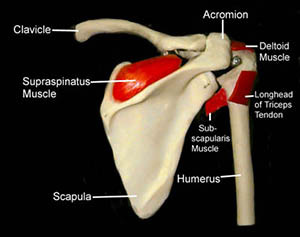 The shoulder joint has great range of motion, but it is not very stable. This makes the shoulder vulnerable to problems if any of its parts aren't in good working order…in particular, the rotator cuff. The rotator cuff tendons have areas of very low blood supply. The more blood supply a tissue has, the better and faster it can repair and maintain itself. The areas of poor blood supply in the rotator cuff make these tendons especially vulnerable to degeneration from aging. Even doing routine chores like cleaning windows, washing and waxing cars, or painting can cause the rotator cuff to fatigue from overuse. You can overcome this risk by strengthening the surrounding muscles. I’m going to show you four simple exercises that will make your shoulders strong, defined and looking amazing. That’s how long I’ve been working out. I’ve worked in gyms. I’ve taken courses and earned certifications in fitness training. More importantly, I’m living, breathing proof that when you use my system you can look amazing and keep exercising until you’re so old that other senior citizens call you ancient! You must avoid exercises that cause unnatural and awkward shoulder joint movement because your shoulders joints are very susceptible to injuries. So, proper form in executing the exercises is crucial. So many work out enthusiasts, even fitness instructors emphasize what I call the “mirror muscles” which are the the pectorals, anterior deltoid and upper trapezius. These muscles are generally exercised through push movements. But in order to make sure that you don’t end up with muscle disparity you should be matching your push exercises with an equal amount of pull exercises which build the “non-mirror” muscles like the rear deltoid. Your shoulder muscles are made of primarily of the anterior deltoid (front deltoid), medial deltoid (middle deltoid) and posterior deltoid (back deltoid). All 3 parts of your shoulder muscles must be targeted to build well defined. The problem here is that most people do not know that they must work on all 3 shoulder muscles and do most shoulder workouts by just concentrating on the anterior deltoids. I’ve created a workout system that specifically targets your shoulders and biceps so you will look amazing and even more importantly, your body will be well balanced. Included in the Guns and Shoulders Workout System are four simple exercises that you can do that will give you shoulders like I have. Your shoulders will look amazing and the different muscle groups will be built up, so that you’ll have less chance of injury and deterioration to your shoulders. Technically, they are your biceps. They are the other key to being very strong and having a physique that people notice. Again, for men, when you do the right exercises in the correct quantity you’ll find your bicep bulging. There’s no question that when a man with a big bicep just even accidentally flexes his arm, ladies get a glimmer in their eyes and other men take note to use caution with this guy. For ladies, when you do the right exercises for your arms, you’ll have nice well toned arms that don’t have any flapping or loose skin. My Guns and Shoulders Workout System also has four simple exercises that will give you amazing biceps. What many people fail to realize is that the bicep is a big muscle and just doing one type of curls won’t allow you to realize your muscle’s full potential. With my system, you’ll do four different exercises so that each part of the muscle and even the forearm will be strengthened. This is really important because just like with your shoulders, you don’t want to have a big healthy bicep and a tooth pick forearm. You’d look funny and it’s not good for your body to be off balance like that. My Guns and Shoulders Workout System has a total of 8 exercises. I think this is really important because you want to be using a system that isn’t so overbearing that you end up quitting. Each exercise can be completed in just a couple of minutes. Imagine, being able to knock out your work out in under a half an hour. Many people are mistaken and think they need to do hour and a half work out to be in great shape. But, nothing could be further from the truth! All you need is to do the right exercises in the correct form. This will maximize your muscle building. If you look at my photo you’ll see that I’m not bulging with oversized muscles. What I’ve got are highly defined muscles. Whether you’re a guy or a girl, these are the kinds of muscles that you want because they look great and they’re healthy. These kinds of muscles are the ones that will keep your body in great shape throughout your entire life. This Work Out Can Be Done Anywhere! That’s another really great thing about my Guns and Shoulders Workout System. You don’t need any special machines or contraptions to do it. All you need is a couple of light dumbbells. Because this program can be done in under thirty minutes and it’s not overly taxing on your body, you can squeeze it any time. Keep a couple of dumbbells under your desk and you can squeeze in your workout while you’re at the office or at home. In fact, just to show you how easy and simple my Guns and Shoulders Workout System is and that it can truly be done anywhere, I actually decided to shoot this video in my office, so you can see for yourself. While your peers are driving off to the gym paying those gym membership fees and burning gas, you’ll be getting ripped while you save on time and money. If you add up what you might pay for gym membership fees and the gas alone, you’re going to be saving over $500 a year. And, I’m not even factoring in the time that you’ll save. This time alone might even be more valuable! I was trying to calculate what would be a fair price for a system where I shared my forty years of exercise experience and training. I can tell you that if I were to coach you personally I would have to charge you a $100 a session, so that could get fairly price. I decided that I really want you to be able to enjoy the amazing results of the Guns and Shoulders Workout System, so even though many other similar kinds of products might go for $100, I’m going to offer it for less. In fact, this system is actually under $75. I’ll give you the exact price, but I want to give you some more good news. The other two keys to being in great shape are having good nutrition and maintaining a healthy cardiovascular system. So, I’ve been able to make a deal with renowned martial artist and professional fitness trainer, Chris Esposito to also include a free bonus cardio training program that he teaches. Chris runs a martial arts and fitness center in south Florida and he knows what he’s talking about. If you follow this extra cardio program on the days you aren’t doing the Guns and Shoulders Workout System you’ll be able to really keep lean and enjoy optimal cardiovascular health. So, getting back to the price…Like I said, I’m giving you my forty years of experience in one compact little DVD which if you follow will get you on your way to having a body like I do. And, let’s remember, I’m not exactly a kid, so you know that I know what I’m talking about. And, you’ll also be getting this free CardioBlast Bonus which is probably worth fifty dollars by itself. That’s right. I want to make sure that you have no reason not start taking advantage of the Guns and Shoulders Workout System, so I’m giving you an amazing deal. I do need to caution you that this amazing low price will likely not stay available for too long. After I’ve done this marketing test and build up a pile of testimonials, I may very well take it on television and start getting the hundred bucks all of these other guys are getting. So, if you want to lock in your low price I would order this right now. I know there is always that person that needs that extra push to take action… that person that has maybe been burned before. So, for anyone who has any doubt about my system, you don’t need to have any. I know how good this system is. I know that if you start doing it, you’re going to get amazing results. I will allow you to try the Guns and Shoulders Workout System risk free for a full 30 days. Because if you try my system for 30 days and find any reason you aren’t 100% thrilled with it, you can send it back to the address on the label and I’ll give you a full refund. I’m not talking about these bogus guarantees where you’ve got to call and get an authorization and explain the reason. I’m talking about a real guarantee. I can do this because this system is so awesome. It’s simple and easy to use. And more importantly it will teach you to do the smart exercises that will make you look amazing and help protect you against injuries or age degradation that can take you out of commission. 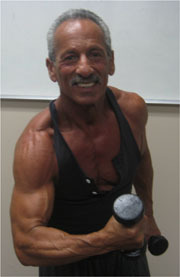 So, won’t you join me in keeping fit and looking great well into your senior years? All you need to do is click the link below and your DVD will be shipped right out to you. 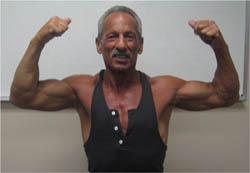 Yes, Larry, I want to get into amazing shape like you with well defined shoulders and arms. I understand the importance of exercising the different shoulder and arm muscles that will maximize my appearance and make my body well balanced and proportionate. I also understand that I won’t have any risk because I’ll have a full 30 day risk free period to try out your program. ©2005-2007 Naturecast Products. All Right Reserved.